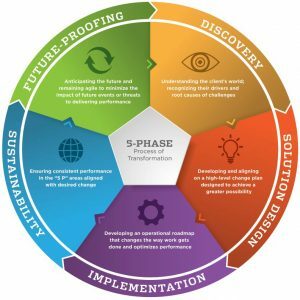 The Sinclair Group’s proprietary 5-phase process for transforming businesses and achieving sustainable organizational and operational excellence is structured, proven and repeatable. Backed by our intellectual property and comprehensive, multi-industry benchmarking database, we have the proprietary processes and tools to provide the required structure and discipline to run your operations more efficiently and safely. Our 5-phase process is proven and repeatable, and delivers profitability, predictability and performance. Our consultants’ deep industry experience comes from high-level management, technology and plant functions. Unlike other consultants, we are not theorists without real-world operational experience. Our team of experts has extensive industry knowledge having spent decades in high-level management, technology and plant functions for blue chip companies worldwide. We understand your challenges and know first-hand how to optimize your existing assets and reduce operating expenses. We will bring you practical solutions and seek out quick wins early in the engagement.